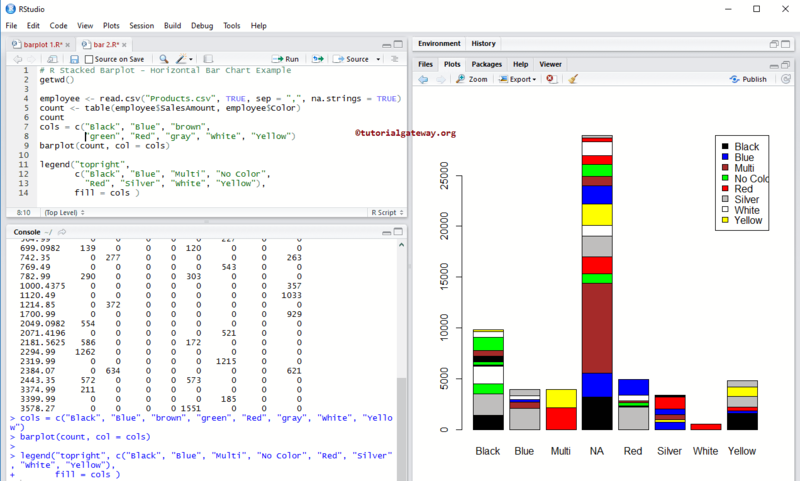 The Bar Chart in R Programming is very useful to compare the data visually. For example, If we want to compare the sales between different product categories, product colour we can use this bar chart. By seeing this bar chart, One can understand, Which product is performing better compared to other. 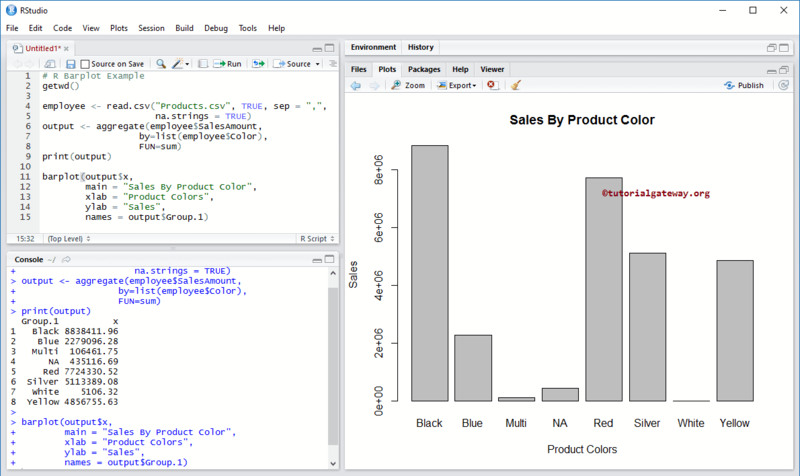 In this article we will show you, How to Create bar Chart, Format its colour, borders, adding legions, creating stacked bar Chart, and Juxtaposed barplot in R Programming language with an example. height: You can specify either a Vector or a Matrix of values. If it is a Vector, the bar chart will be created with a sequence of rectangular bars, and each bar height depends upon the vector value. And if the height is a Matrix of values and beside is FALSE, each matrix column represent the bar and the row values will create stacked sub bars. If beside is TRUE, and height is a Matrix of values then each matrix column represent the Juxtaposed bar. width: It is optional but you can use this to specify the width of a bar. names.args: Please specify a Vector of names you want to plot below each bar or group of bars. If we omit this argument then the bar chart will take the names from columnames if it is a matrix, or the names attribute of height if it is a vector. 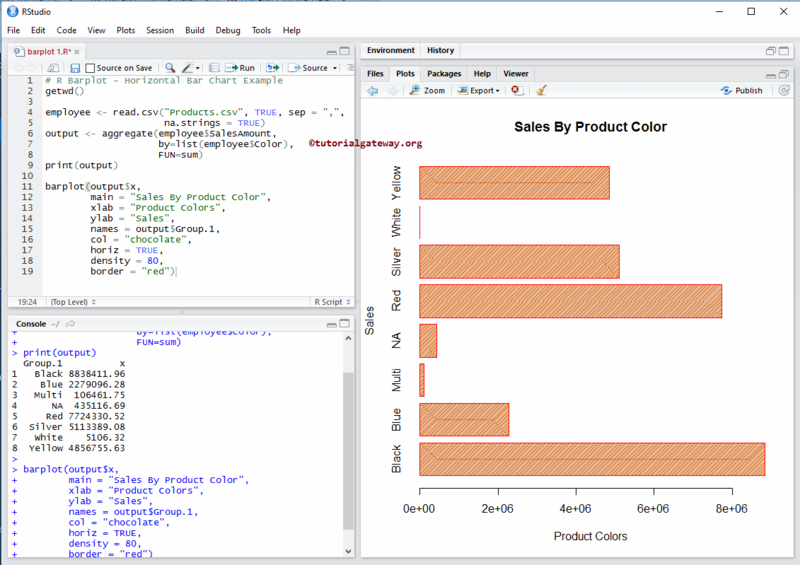 text: Please specify a Vector of text used to construct the legend for the bar chart, or a Boolean value indicating whether you want to include the legend or not. beside: It is a Boolean argument. If it is FALSE, the height columns are portrayed as stacked bars, and if it is TRUE the columns are portrayed as Juxtaposed bars. horiz: It is a Boolean argument. If it is FALSE, the bars are drawn vertically. If it is TRUE, bars will be drawn horizontally. angle: You can assign the slope of shading lines using this argument. col: Please specify the vector of colors you want to use for your bar chart. By default, it will use a set of 6-pascal colours. border: Please specify the color you want to add to the borders. If you use border = NA then borders will be omitted. 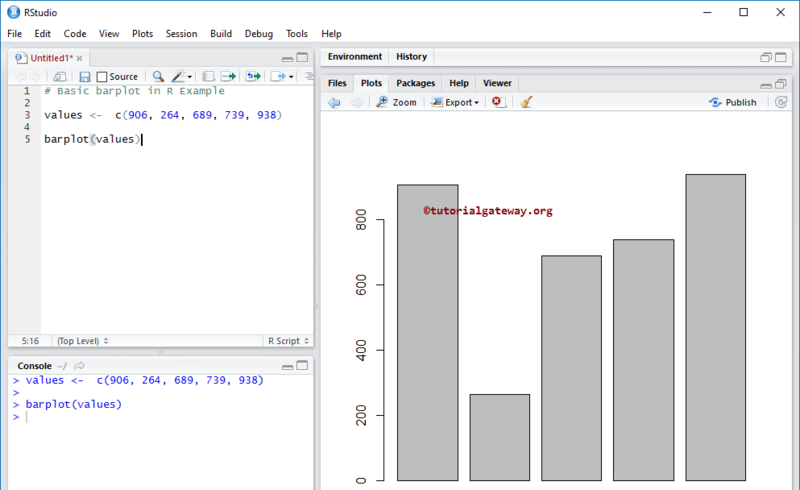 main: You can provide the Title for your bar chart. 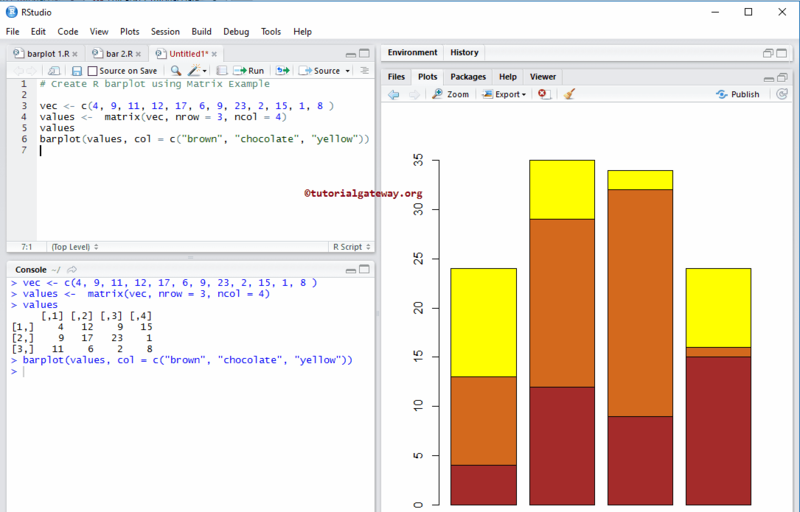 sub: You can provide the subtitle (if any) for your bar chart. xpad: It is a Boolean argument. Do you want to allow the bars outside the region? axes: It is a Boolean argument. If it is TRUE, a vertical (or horizontal, if horiz = TRUE) axis is drawn. axisnames: It is a Boolean argument. If it is TRUE, and if there are arg, the other axis is drawn (with lty = 0) and labelled. axis: Expansion factor for numeric axis labels. names: Expansion factor for bar labels. lty: It is a graphical parameter, which is applied to the axis and tick marks of the categorical axis. add: It is a Boolean argument and by default it is FALSE. If it is TRUE, bars should be added to an already existing plot. legend: List of arguments you want to add to the legend() function. Next, we used the bar chart to draw the bar chart. From the below code snippet you can observe that bar height will be decided on the values. From the below code snippet you can observe that we used the Aggregate function to find the total amount of sales of each colour, or we can say the Sum of Sales Amount Group By product Color. Above statement will return the output as a List. So, we are using the $ to extract the aggregated data (sum of sales amount) from List. 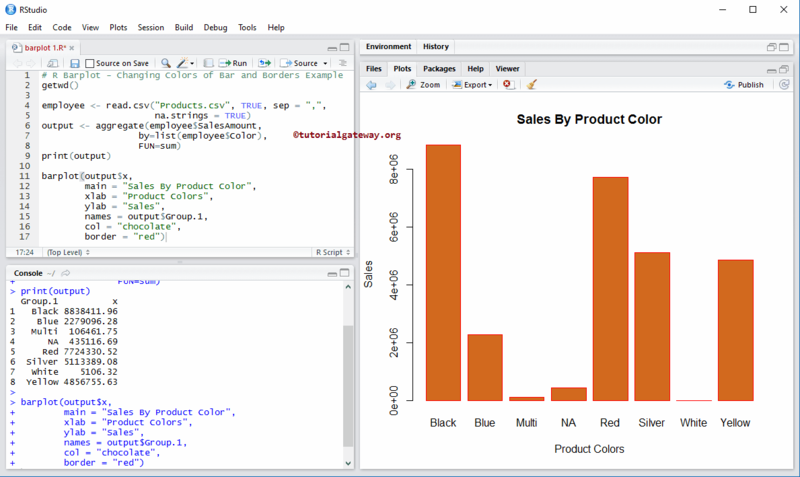 In this example, we will show you, How to change the bar chart colours using col argument, and border colours using border argument. Next, we are creating a bar chart using the above-specified table. 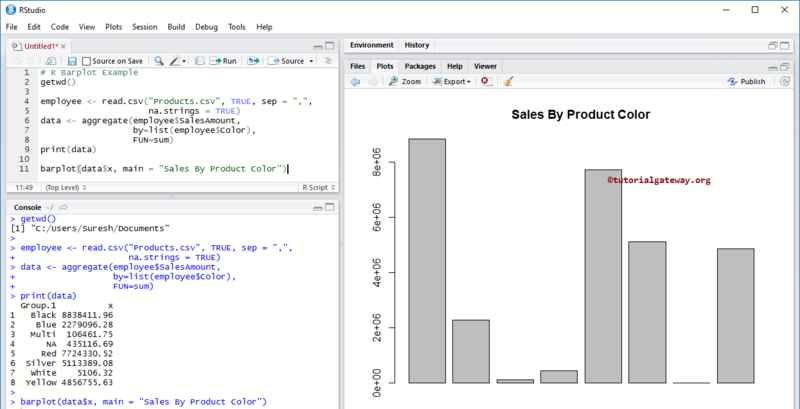 employee <- read.csv("Products.csv", TRUE, sep = ","
In this example, we will show you, How to create a bar chart using the Matrix values.